I've been following Angela at Oh She Glows for quite awhile now. Though "healthy living" isn't exactly the theme of our blog (especially my part with all the butter-laden baking), there are a few other of these go-getters that I follow who are up on things like running and find many different ways to eat kale. If it sounds like I'm being a bit cheeky, its only because I'm genuinely jealous of their zeal for health. A couple years ago, when I first found Angela's blog, I saw the also had a link for her site The Green Monster Movement. I'm notorious for getting into healthy fads (not that Green Monsters are fads, at all - only that I end up treating thing I get into like fads... here today, gone tomorrow! ), only to instantly forget about them the second I see a scone or cookie... or even think about a scone or cookie.. ... ... droool... where was I? Oh, right. A year or so ago, I got very excited about the idea of a juicer. I don't think I blogged about it, but I spent a good two weeks after I got my fabulous Breville juicer juicing everything in sight. Then I read about how when you juice, especially sweet things like apples (which I was going through by the bushel! ), you get all the calories and sugar from the fruit and none of the good fiber. So when I realized that I wasn't drinking my meals, but essentially just adding excess calories and sugar, the juicer went silent sitting in the corner of my counter. But sarcastic as I'm being, I do try to incorporate healthy things into my diet every single day. At the end of the day I count how many servings of fruit and veggies I've had, and I try to make sure I'm hitting more veggies than fruits. Remember, tomatoes and avocados are fruits, people! 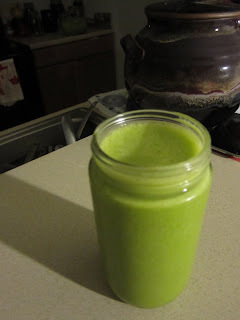 And though I've certainly gotten the equivalent of the Green Monster at health food places and when the Vitamix guy is at whole foods, I've never gotten over the hump of making one at home. Before today. For the last month I've been going for acupuncture (which I LOVE), and the acupuncturist is always giving me Chinese Medicine food advice, which I'm terrible about taking because I don't want to go buy a crock pot - something she tries to assure me I need. Yes, this my "chinese medicine" gif. don't ask, I have no idea. Anyway, she also impressed upon me the importance of trying to get two leafy greens in before noon. WHAT?!? If you know me at all, you know I'm barely up before noon, let alone eating leafy greens for breakfast. While I do eat plenty of leafy greens, especially since our CSA share has been inundated with them, it's really hard for me to palate eating veggies for breakfast. I know this is a silly prejudice, but I think Angela's green monster may have solved the problem. I barely slept last night, and so this evening I took a 3 hour nap (hey, don't judge!) between 530pm and 830pm. When I woke I knew I really needed to run over to Target for some kitty food, among other people-type necessities. I cut myself a small piece of bread, slathered on some PB and honey with a glass of milk and booked it out the door. But I'm well away a piece of bread with PB and milk is a sad substitution for dinner - even if the bread was whole wheat sprouted (told you I was healthy). While I was out I remembered that I finally put water into my ice trays yesterday and so there was probably ice. And there was definitely both spinach and kale and bananas and PB and flax and almond milk. ALL THE INGREDIENTS FOR A GREEN MONSTER! It was meant to be. Seriously. So I got home and blended me up one. Guess what, it was freakin' fabulous. I did not use kale, I thought I'd play if safe with spinach for the first go around, but I could have put way more spinach in than my slight 2 handfuls. Maybe I can make the acupuncturist happy after all. please ignore my dirty sink. thank you. Put all the ingredients (except the ice) in your blender and blend till smooth. Then add in the ice and let it work its magic. Tada! I also drizzled in about 1/2 tsp of honey at the end. Hello and YUM! I love me a good green smoooooooothie!